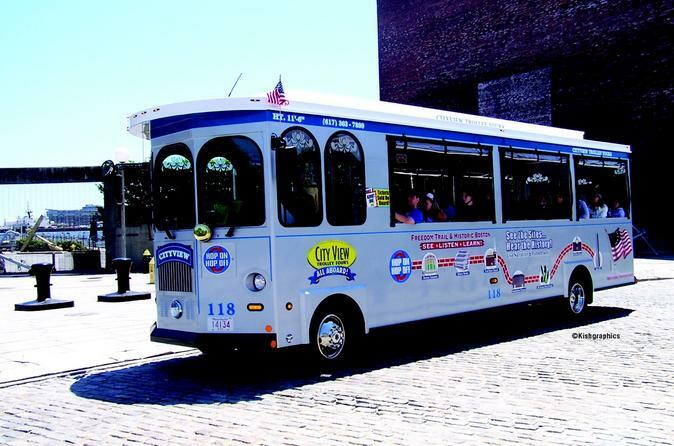 Ride through the streets of Boston and take in the highlights with a convenient and easy hop-on hop-off trolley tour. Discover why this city is called the Cradle of Liberty! Learn about historical events including the Boston Tea Party, Paul Revere’s Ride, the Boston Massacre, and the role Bostonians played in the American Revolution on this fully narrated tour. If you're feeling hungry, head to Quincy Market, Faneuil Marketplace Hall, and the Historic Waterfront or "Little Italy" for some of the best shopping and restaurants in the town. Feel free to hop off to have a closer look and re-board another trolley to continue your city adventure. Upgrade your experience to include a 45-minute Boston Harbor Cruise (seasonal, if option selected) for just $5.00 more. Some exclusions apply. Please Note: This ticket is for Trolley Tour ONLY and does not include admission to the Wax Museum, Harbor Cruise, or any of the other attraction sites.